The following paper provides an overview of the growing literature on subjective wellbeing or more commonly known as “happiness”. Traditionally, wellbeing has been identified with a single objective dimension: material progress measured by income or GDP. However, it is now widely accepted that the concept of wellbeing cannot be captured solely by GDP: wellbeing is multidimensional encompassing all aspects of human life. One approach to measure multidimensional wellbeing is to use objective indicators to complement, supplement or replace GDP. Another approach is through subjective measures: asking people to report on their happiness and life satisfaction. The paper presents the main findings from the literature on the economic and non-economic determinants of happiness. Although happiness is important in terms of economic theory and policymaking, the paper also shows that happiness indicators possess some limitations as measures of wellbeing. First, should happiness be the ultimate human goal? Second, are happiness indicators a good guide for policymaking? 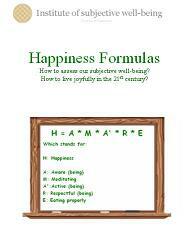 Finally, are happiness measures considered good quality indicators?